Hostinger is ideal for users looking to set up and host a domain and WordPress run site, who are not highly-skilled coders or website designers. Hostinger is a premium web hosting service for anyone looking to try out WordPress web design and hone their webmaster skills. It advertises a 99.9% uptime, which is ideal for high-traffic websites concerned about disruptions in service. The dashboard for the hosting service is rather busy and complicated, though with a little practice even novices should be able to get the hang of it, and they can easily contact customer service if need be. The website builder is a different story—it has the sort of simple, drag-and-drop setup that makes website building a breeze even for beginners. 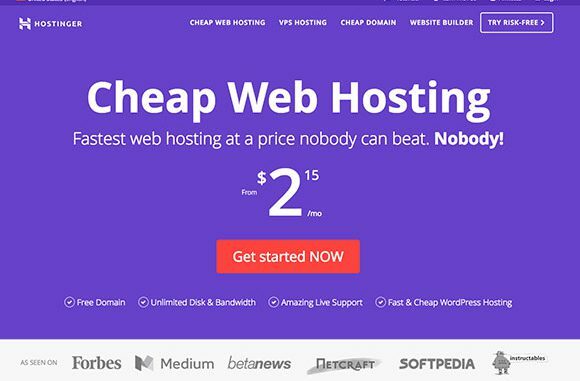 Hostinger advertises its plans as being as cheap as $2.15/month for single web hosting – up to only $7.95 for business web hosting, but you have to read the fine print. The $2.15 price is only available if you order a 36-month plan for the single web hosting package. Otherwise, it costs $3.99/month, and you must purchase a minimum 3-month package. Likewise for premium web hosting—on the homepage the company advertises $3.49/month, but that rate only applies if you order a 48-month package. For the minimum 3-month package, the premium hosting costs $8.84/month, more than 2.5 times the price touted on the homepage. The 3 hosting plans are shared, premium, and business. With the shared plan you get only one website and one email, 10GB of disk space and 100GB bandwidth. With both the premium and business plans, you get unlimited websites, disk space, email accounts, and bandwidth, a free domain name, and better power and speed. 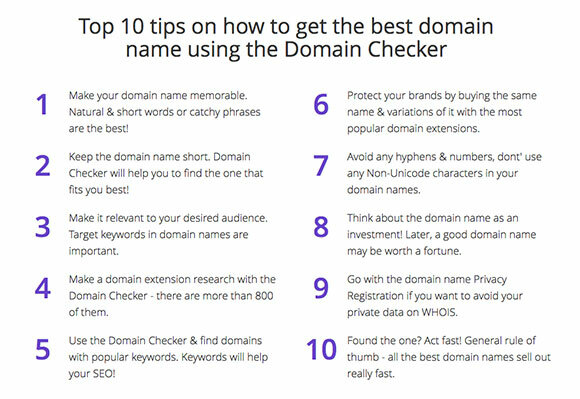 For domain names, one that ends in .xyz is only $.99 cents a year, while a .com is $8.99, .net is $9.99, and a .biz is $11.99/year. Hostinger features hundreds of templates, grouped by theme. The platform advertises that all websites built with Hostinger site builder are 100% SEO friendly and work on all mobile device screens. The builder can incorporate Ecommerce features for small businesses, including an online store and paypal widgets. The templates are edited with an easy drag-and-drop interface. Hostinger features a 24/7 live chat customer service option. Two queries were answered quickly—one was placed late in the evening and within 8 minutes a representative had logged on and answered the query, even though the system said there was a queue. The site also features an extensive knowledge base, and if questions can’t be answered there or the live chat isn’t responsive, a service ticket can be submitted. Hostinger is clearly proud of its live chat, which pops up often at the bottom of the screen. While this could be a nuisance for some viewers, the service is responsive and helpful. Hostinger describes its “Cloud VPS” as having “blazing speed” and a no-downtime policy, which should keep your website running quickly and online at all times. Its VPS system has its own control panel and is easily customizable. The cheapest VPS server plan is available for $4.95/month, while Hostinger’s priciest plan runs $75.95/month. The difference of course is in speed, storage, and bandwidth. With the cheapest plan you get 1GB RAM, 20GB disk space, and 1000GB Bandwidth. For $75.95/month you get 8GB RAM, 160GB disk space, and 6000GB Bandwidth. VPS hosting is a good idea if you need the greater speed to deal with increased traffic, and you want more control over your web hosting. If these aren’t priorities, and you run a basic website with modest or low traffic, shared hosting should be enough. Hostinger does not currently offer any dedicated hosting options. The only options are shared or VPS. Other website hosting companies have better names and more obvious and flexible pricing options. Nonetheless, Hostinger is an affordable web hosting service that has a number of scalable options for websites. It promises great speed and an almost perfect uptime rating. Combined with solid customer service, Hostinger answers the needs of most webmasters. Hostinger was launched in 2004 as a Lithuania-based company called “Hosting Media.” The company today boasts 39 localized services worldwide and over 29 million users. 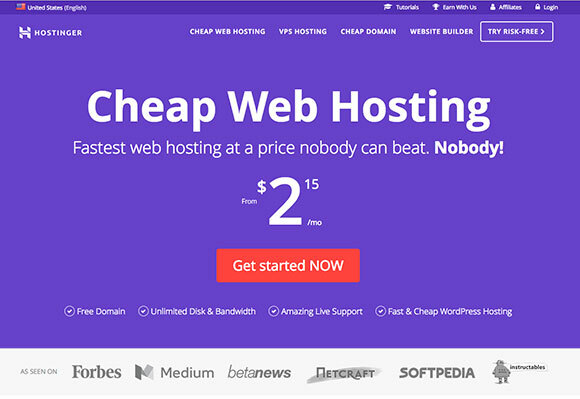 Hostinger grew out of the site 000webhost.com, which still offers completely free web hosting—though without many of the features provided by Hostinger’s paid service. Copyright © 2009-2018 How Vps All Rights Reserved. Reproduction in whole or in part in any form or medium without express written permission of How Vps is strictly prohibited.